Teachers Pay Teachers has a board to help care for student mental health. 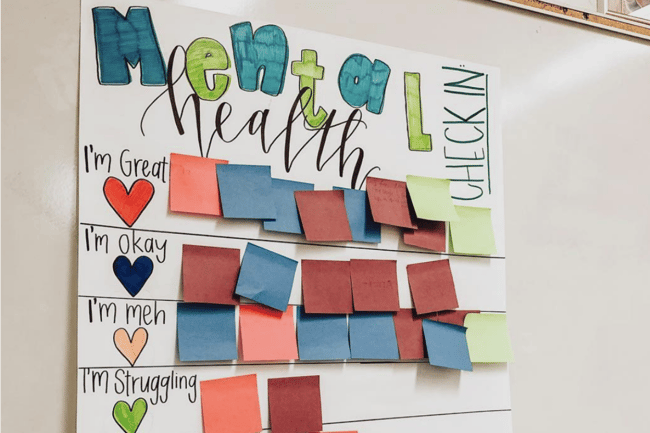 A teacher's mental health check-in board has gone viral. Because it's bloody brilliant. Erin Castillo is an American school teacher who’s created an amazing resource to help teachers check in with their students about their mental health. Posting the idea on Instagram earlier this month, the photograph shows a teacher’s whiteboard titled “Monday Check-in”, with sections labelled, “I’m great”, “I’m okay”, “I’m meh”, “I’m struggling”, “I’m having a tough time and wouldn’t mind a check-in”, and “I’m not doing great”. The idea is that students place a post-it note with their name discreetly on the back in the section they want to, and throughout the week a teacher will know to touch base to see how the child is doing. Castillo explained the concept further in her caption. “I asked my students to write their names on the back of a post-it note so I could check in with ones in the bottom two sections,” she wrote. “I explained the green section as them struggling, but speaking to another adult or trying to work through it themselves. Castillo also explained she felt it was important her students knew they weren’t alone, and that they mattered to her. SOFAS AND PILLOWS AND CHAIRS… OH MY! ••••••••••••••••••••••••••••••••••••••••••••••••••••••••••• I’ve done it! Im starting to fill my room with some flexible seating options and the kids and I are loving it! • I came up with this option to assign students to a spot for a week. I still have enough desks in my room for all my students so they have a “home base” location, but can choose to sit in their flexible seating spot if they wish! • Each Friday they will fill out a choice sheet and explain why they deserve one of their choices. Some strong examples include: “I completed all my homework this week!” “I made a smart choice and kept my phone away!” “I improved my warmup score this week!” “I leveled up in reading plus!” Etc. This offers my students the opportunity to reflect on their progress for the week and to be rewarded with a special seat! • My plan is to shuffle up the kids as much as possible so they can all enjoy each location, but also reward those that I see putting in extra effort with their first choice spot! • Each color represents a different class, and the envelope holds extra names. • Do you do flexible seating? How do you decide who goes where? Castillo’s post went viral after it was shared by many educators. The board’s popularity inspired Castillo to update the post with the announcement that she is offering a free, printable version of the chart on the site Teachers Pay Teachers. This isn’t the first time Castillo has shared an inspired idea for other educators; in fact, her Instagram is full of projects and ways to make her classroom the best environment for her students it can be. 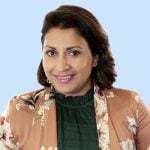 For example, she’s posted about her board for flexible seating arrangements to help students feel comfortable, and her ‘You Matter’ board, which is designed to encourage her class to reflect on their strengths and their value as people. Do you know a teacher who cares about their students beyond the expectations of their role? Tell us in the comments below.